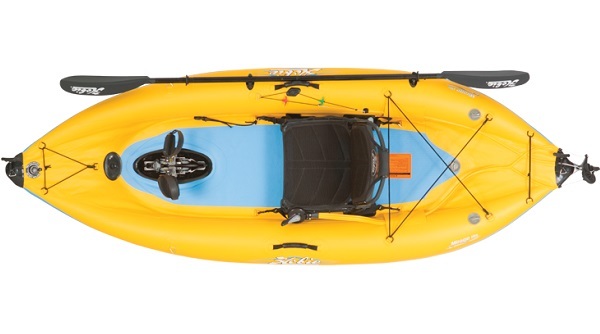 The Hobie I9s is perfect for those you want a Mirage Drive kayak that can be transported easily in the boot of your car. Hobie’s i9S was specifically designed for people are limited on storage space but who dream of spending their time kayaking, fishing or sailing. It packs nicely within its own rolling travel bag, so it can fit in the boot of your car, on your boat, in your motor home — you can even take it on the plane for your next vacation. The i9s features the super comfortable Vantage CTi seat system. The raised seating position of the Vantage seat off the deck makes for a drier, more comfortable ride. The new Mirage Drive system will see you zipping around your favourite bay, lake or river. The new i9s features the Mirage Drive 180 full power pedal drive in forwards and reverse! Switching between forwards and reverse is as simple and easy as pulling a toggle on the drive system. The drive system features 'Glide Technology' with roller bearings found on the major pivoting components of the drive, for a smoother and easier pedaling experience. The i9s also comes with a 4 piece paddle incase you fancy paddling. 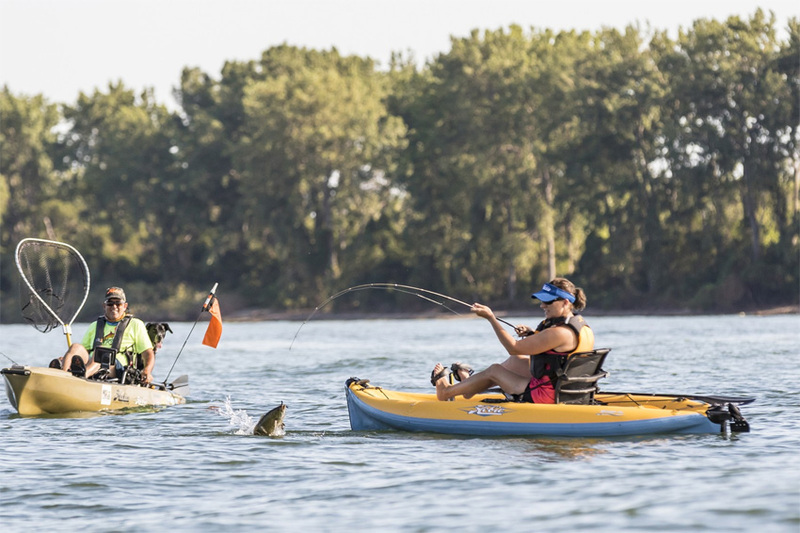 The Hobie i9s is lightweight and accelerates fast through the water, but still maintains an impressive turning radius, allowing you to pedal into the tightest of spots. This makes the i9s great for exploring overgrown rivers and tight coastline! 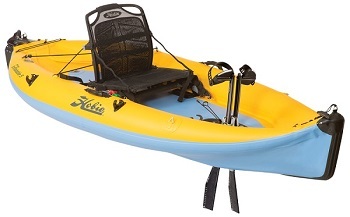 The fingertip steering of the twist-n-stow rudder system offers the user hands free travelling, ideal for fishing, photography or bird watching. The i9s is at home cruising around on calm inland waters and sheltered coastal waters. It is great for a spot of fishing too! Width: 0.91 m / 36"
We offer a delivery service for the Hobie I9s throughout the UK & Ireland to home and work addresses. If you are local to our shop in Hamworthy, Poole then we may be able to deliver a Hobie I9s with one of our own vehicles. For boats, this is free to most BH Postcodes - please call us on 01202 625256 to discuss your requirements. 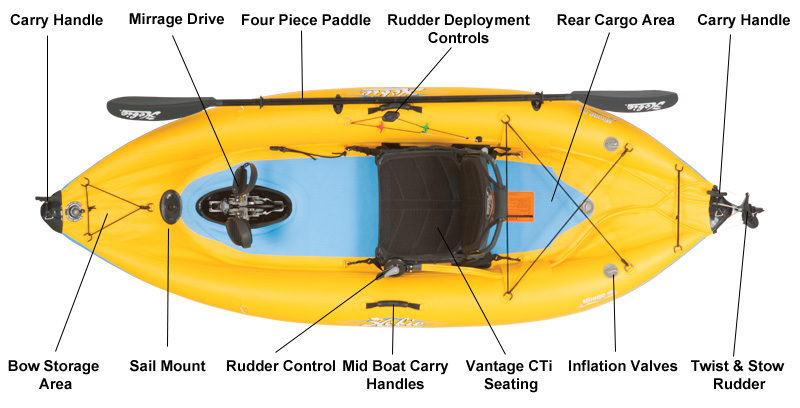 Buy a Hobie I9s online from our website and collect from our shop in Hamworthy, Poole or you can collect from any branch within the Canoe Shops Group. There is no cost associated with instore collection.